Zorg, a handyman, is living a peaceful life in rural France, working diligently and writing in his spare time. Then Betty, a vivacious and unpredictable woman, walks into his life. Initially, her wild ways are fun and spontaneous and Zorg falls in love with her, but Betty’s behaviour slowly gets out of control as she spirals into insanity. The film opens on a shot that creeps up on a couple making love on a bed – their sweating intimacy is contrasted by a voiceover telling us that they’ve only known each other a week. Every frame of Jean-Jacques Beineix’s film carries the seal of its country of origin as well as the era in which it was made. Only in the 1980’s could such a tragic film be created with such a visually-gorgeous-but-empty style. Only in France could a story of passionate love open so erotically. Only in France could a film’s tone be misogynist, seeming to blame Betty’s insanity on the inherent ‘madness’ of the female of the species, and yet seem authentic. Betty’s descent into insanity and destruction is well paced and compelling. 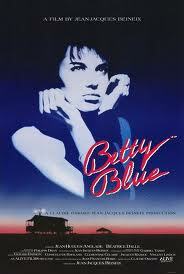 Beatrice Dalle (Betty) never made another film worth noting again, but this film alone was enough to make her an icon of late 20th century cinema. 183 minutes.